Just a note to say many thanks to Alexandra and her professional team. We were a little worried how a private tour in such exotic countries as Romania and Bulgaria would work out. We had never been to Eastern Europe and were a little concerned about being the only clients in a car with one or two strangers. Well… we needn’t have worried. 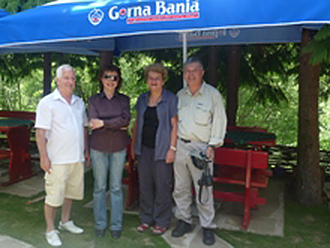 Our guides and driver were friendly, knowledgeable and very professional. This was a wonderful two weeks and we continue to sing the praises of Altours (and Alexandra) to anyone and everyone here in Australia. Alex’s willingness to tailor the itinerary to suit the demanding constraints created by our other travel arrangements made the planning of the trip smooth and trouble free. Her continued monitoring and ‘tour group intelligence network’ whilst we were on the road meant that we sailed between potential ‘tourist congestions’. We can highly recommend her services.